Bring 8 cups water, salt and 3 tablespoons sugar to a boil in a 3- to 4-quart heavy saucepan, then add tapioca in a stream, stirring constantly. Reduce heat and briskly simmer, uncovered, stirring occasionally, until tapioca is almost completely translucent, 35 to 50 minutes, depending on size of tapioca. While tapioca is cooking, simmer 1¼ cups rhubarb, 1/3 cup sugar, pepper, a pinch of salt, and remaining 1/3 cup water in a 2-quart heavy saucepan, uncovered, stirring occasionally, until rhubarb is just tender, about 8 minutes. Purée in a food processor until smooth (use caution when blending hot liquids), then reserve ¼ cup (to add to tapioca) and return remainder to saucepan. Stir in raw rhubarb and simmer, stirring occasionally, until tender, about 5 minutes. Stir in lemon juice, then transfer to a shallow bowl. Drain tapioca in a sieve and transfer to cleaned 2-quart heavy saucepan. Stir in half-and-half, remaining 2 tablespoons sugar, vanilla, and reserved rhubarb purée and bring to a simmer, stirring occasionally until sugar is dissolved. Cool slightly, then divide among 4 dessert bowls and top with rhubarb. The size of tapioca pearls varies widely. What one brand calls "small," another brand might term "large," so don't pay much attention to the label. 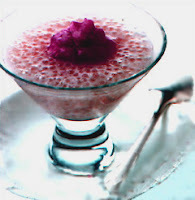 Instead, look for pearls that are 6mm to 8-mm in diameter for making this dessert.